Since 1989, Lyndell Brown (1961–) and Charles Green (1953–) have worked as one artist at the convergence of painting, photography and digital reproduction – their art explores ideas around visual and cultural archives, and the links between memory and representation.1 In 2007, they served as Australian official war artists in Iraq and Afghanistan, and subsequently collaborated with fellow war artist Jon Cattapan on a number of related research projects. This partnership was foregrounded in the exhibitions Spook country, ARC One and Station, Melbourne (2014) and Lesson plan: A collaboration, Bruce Heiser Gallery, Brisbane (2015). They have also held numerous solo exhibitions. Their co-authored monograph Framing conflict: Contemporary war + aftermath was published by Macmillan Art Publishing in 2014. Brown/Green’s work is represented in the National Gallery of Australia, Canberra; many state, tertiary and regional collections; and in corporate and private collections in Australia and overseas. The method is central to Brown/Green’s project to dissolve the tensions around documentation and representation, which arise at the juncture between photography and painting. 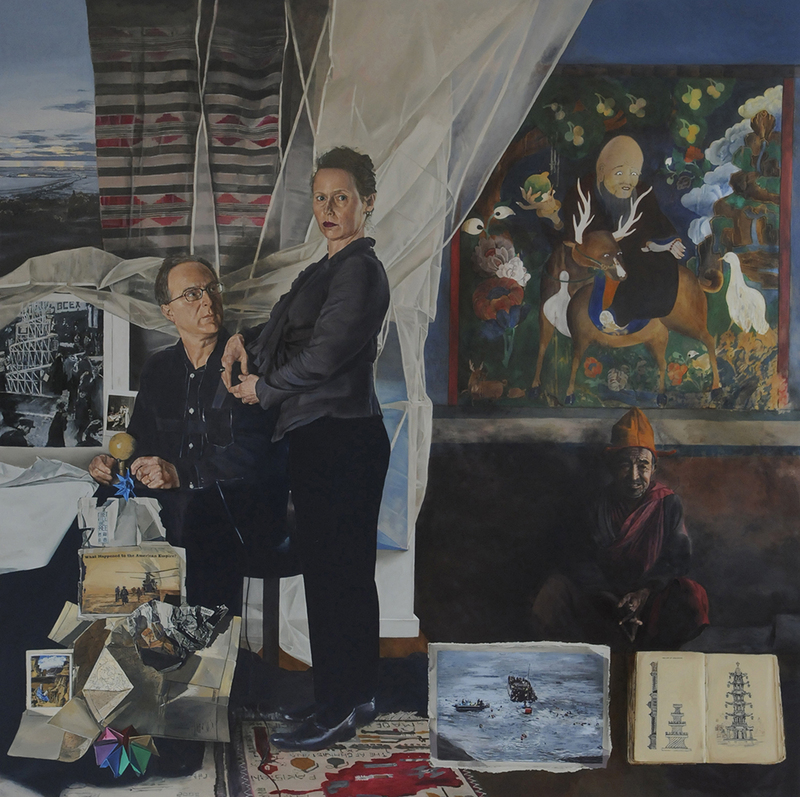 Brown/Green’s earlier double self portrait The painters’ family 2007, the first in a proposed series, is held in the private collection of banker Harrison Young. Refer to Charles Green, email to the author, 30 March 2016, UQ Art Museum artist’s file. Amelia Barikin, Lyndell Brown and Charles Green, “The museum in hiding: Framing conflict,” The International handbooks of museum studies: Museum theory, ed. Andrea Witcomb and Kylie Message (John Wiley & Sons Ltd., UK, 2015), 485. Professor Charles Green lectures in Art History at the School of Culture and Communication, University of Melbourne. The quote is one of Faulkner’s best known lines and comes from his 1951 novel Requiem for a nun, first published by Random House. Charles Green in an email from Bruce Heiser, 29 March 2016, UQ Art Museum artist’s file. The current Director of the UQ Art Museum Dr Campbell Gray took Brown/Green to see the Jetty, as Green recalls: ‘It’s a dusk view of Robert Smithton’s Spiral Jetty, 1970, from a hill high above Great Salt Lake. Campbell drove us there when he was at Salt Lake City (actually he was at Provo, a twin city). Smithson had an enormous impact on our art: his theories of entropy, science fiction, dislocated images.’ Other images represented in the compendium include a photograph taken by Australian photojournalist Stephen Dupont depicting Gurkha soldiers in Helmand province, Afghanistan, which was published in a New York Review of Books article and informs Brown/Green’s Empire 2010; a newspaper clipping relating to Mohamed Haneef, the Brisbane doctor of Indian origin who in was arrested in 2007 for terror-related offences but later released without charge; and a photograph of a ‘Tibet will be free’ banner taken at the Beijing Olympics. Refer to Charles Green, emails to the author, 30 and 31 March and 1 April 2016, UQ Art Museum artist’s file. Charles Green, email to the author 30 March 2016, UQ Art Museum artist’s file. Rich with allusions to art, travel, politics and culture, Brown/Green’s self portrait is as much a tribute to Hans Holbein the Younger’s The Ambassadors 1533, as it is to the Boilly painting on which it is directly based. Tags: Charles Green, Lyndell Brown. Bookmark the permalink.